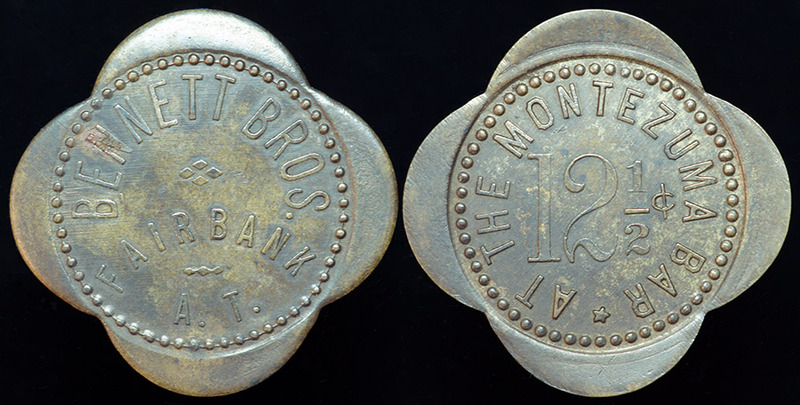 BENNETT BROS. - FAIRBANK A.T. ; AT THE MONTEZUMA BAR 12 1/2 c. This very handsome token is listed as rarity R8, the bar was in operation from at least 1906 - 1909. This is the only known token of Fairbank, near the banks of the San Pedro River in Cochise County. It's a popular hiking Ghost Town, near the ruins of the Spanish Land Grant and Contention City.